Just four simple ingredients and “bam!”–you’ve got cookies! 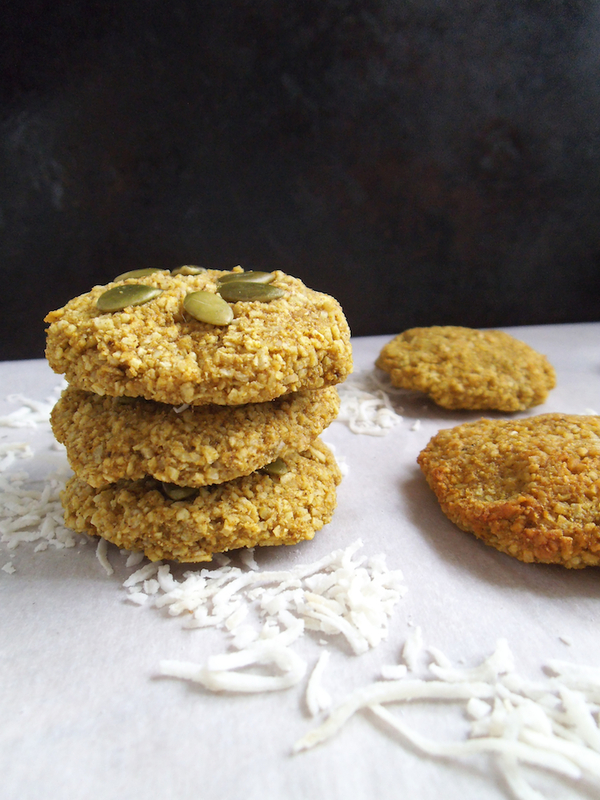 Coconut and banana need no other sweetener, so these flourless cookies are impossibly healthy too! When I want to make cookies both delicious and healthy, I usually turn to sweet potatoes. 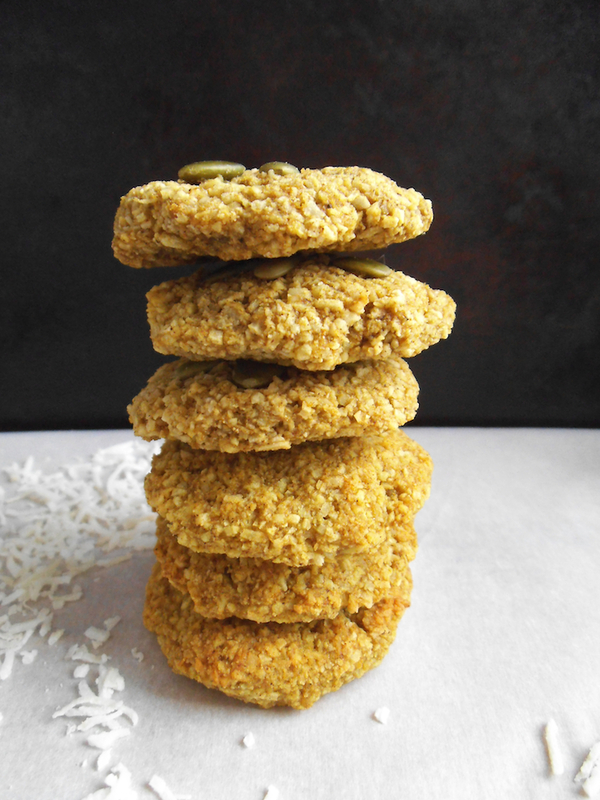 My Cocoa Nut Breakfast Cookies and Healthier Samoa Coconut Cookies are proof of this trend. But sometimes I would rather skip shredding or cooking sweet potatoes. That led me to try a 2-ingredient cookie recipe that seemed too good to be true. Still, to have fresh cookies the easy way seemed worth a try. Not being one to leave well enough alone, however, I spiced the cookies up a bit. Turmeric tastes wonderful with banana and coconut, as one sip of a Soothing Spiced Smoothie with Turmeric will confirm. 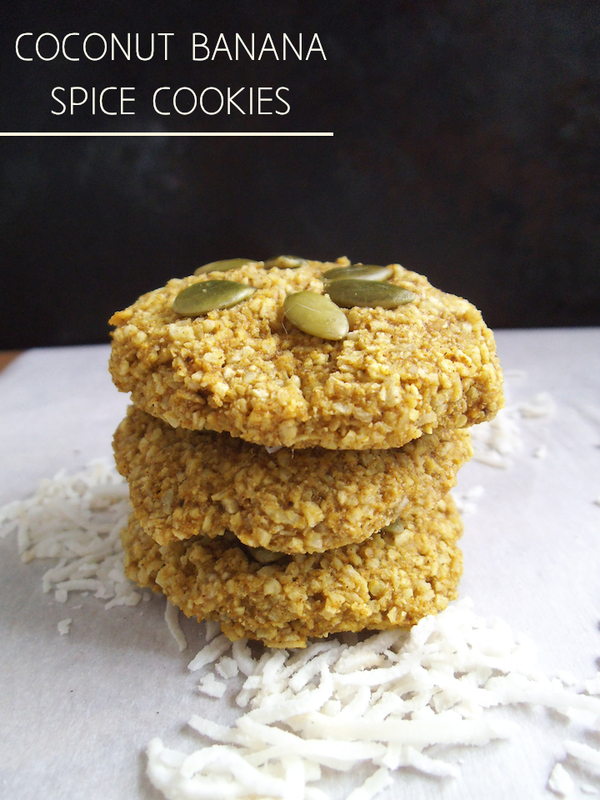 So I added a similar blend of turmeric and cinnamon to these cookies and was thrilled with how they turned out. 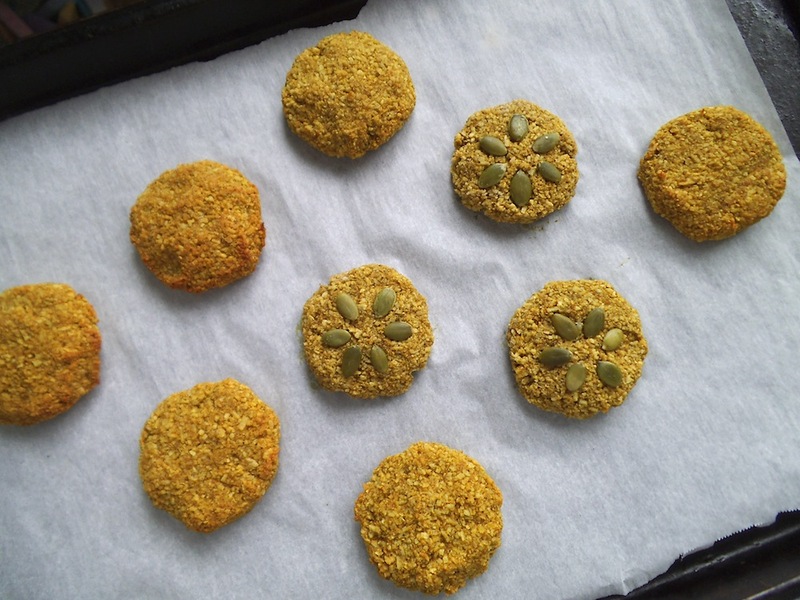 Not only did these get a healthy boost of anti-inflammatory spices, the cookies gained a beautiful golden hue. And they were among the quickest and easiest cookies I have ever made! A few of the cookies became five-ingredient cookies because I thought it would be fun to top them with pepitas (raw pumpkin seeds). Pretty like a daisy, aren’t they? Another bonus to this vegan recipe is that you can eat the dough without worry. 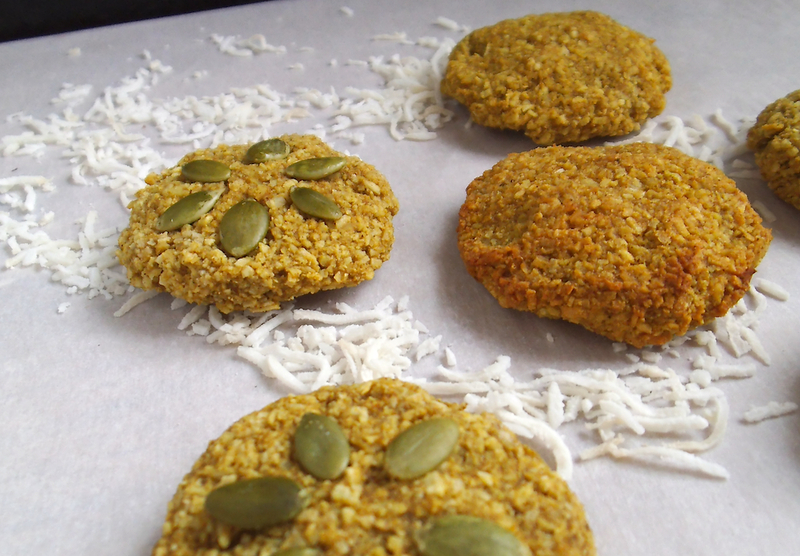 It is egg-free and is essentially a baked variation of Instant Banana Coconut Grain-Free “Oatmeal.” And of course you need to taste the dough as you go, to make sure you get the spices exactly how you like them. Blend the ingredients together in a food processor until the dough holds together well. Add another 1/4 cup coconut if dough seems runny. Shape dough by hand into round cookies about 1/2-inch (1.3 cm) thick. Place on baking sheet lined with lightly greased baking parchment. Bake at 350 degrees until fragrant and toasted. Cookies will be soft. Oh yum! I love the idea of the turmeric! I’ve recently begun to use it a lot more and now I’m curious to try it out in a cookie! I can’t believe how quickly these come together- definitely a great recipe to have on hand. Thanks for sharing!